How do I email an invoice? How do I enter a payment? How do I copy an invoice? How do I attach files to an invoice? Click the Invoices menu item and press the New button. 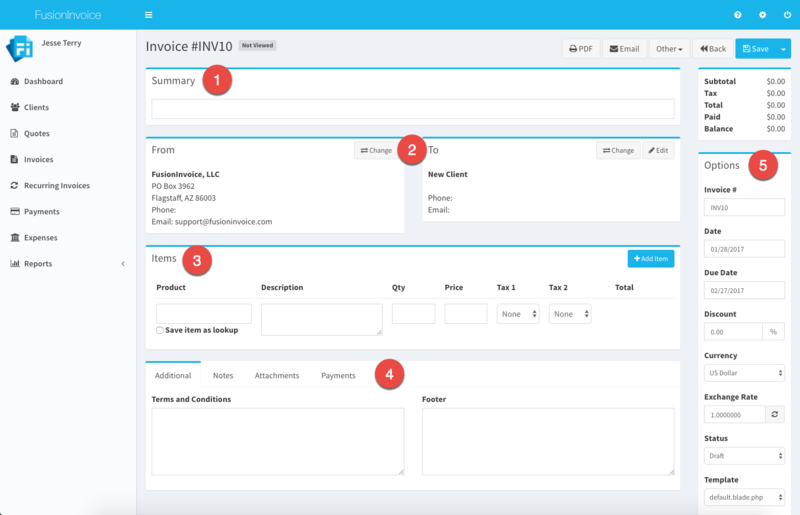 The Create Invoice screen will prompt you for the client name, invoice date, company profile and group. If the invoice is for a new client, type the client's name in full. You will be able to edit the other details for this client record from the next screen. If the invoice is for an existing client, start typing the client's name and you will be able to select your existing client from the list that appears. The date defaults to today's date but can be changed if necessary. The company profile is where the invoice will pull your company name, address, phone number, and other company specific details from. The group controls the format of the number assigned to each invoice. Press Submit when done and you'll be taken to the Invoice Edit screen. The Invoice Edit screen is where you'll add line items as well as define further properties and options for your invoice. Entering a brief summary or description of the invoice will make the invoice easier to find and search for. Terms and conditions as well as text to appear in the footer of your invoice may be entered on the Additional tab. Defaults for these fields may be set in System Settings on the Invoices tab (default values for these fields will not appear on invoices already created). Public or private notes may be entered on the Notes tab. Notes entered on this tab will be visible to clients viewing the invoice using the public link unless they are marked as private. Clients may leave notes on an invoice when viewing the invoice using the public link as well. File attachments may be uploaded to an invoice on the Attachments tab. See How do I attach files to an invoice? for details. Invoice # - This is generated according to the group selected when the invoice was created. Date - The date the invoice was issued. Due Date - The date payment on the invoice is due. Status - The current status of the invoice. Once an invoice has been emailed, the status will automatically update itself to Sent. Once an invoice has been paid in full, the status will automatically update itself to Paid. If you have printed an invoice for delivery, you can manually change the status to Sent. Press the Email button from the Invoice Edit screen. * Note that the Email button will not appear unless you have configured your email settings in System Settings on the Email tab. The Email Invoice screen allows you to add additional recipients, change the subject and / or body, if necessary. Press the Send button to send the email. Payments collected manually can be entered against an invoice from the Invoice Edit screen by pressing the Other button and choosing Enter Payment. 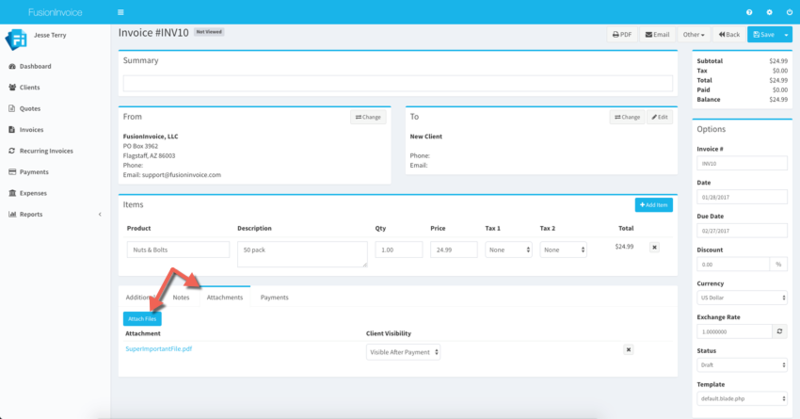 If the invoice is being paid in full, the amount field will already contain the full balance amount so you won't have to enter or change anything. If the payment being made is only a partial payment, adjust the amount as needed. The date will default to today's date and can be adjusted if necessary. Choose the payment method to assign to the payment. Additional payment methods can be entered in System -> Payment Methods. A note can be optionally added to the payment. If you'd like to email the client with an email receipt of payment, check the Email Payment Receipt box. Press the Submit button and the payment will be submitted to the invoice. Review the date, company profile, and group. Change if necessary. Files of any type may be uploaded as an attachment to an invoice by clicking the Attachments tab on the Invoice Edit screen and pressing the Attach File button. Visible - Clients will be able to access this attachment from the invoice public link. Not Visible - Clients will not be able to access this attachment from the invoice public link. Visible After Payment - Clients will be able to access this attachment from the invoice public link only after the invoice has been paid in full. * Note that attachments uploaded to an invoice do not "attach" themselves to the invoice PDF output. Invoice attachments are intended to provide an easy way to deliver digital assets related to an invoice to your clients (or just to store related files for your own purposes).